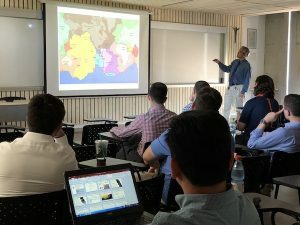 On January 11th, our third day in Santiago Chile, we visited Pontifica Universidad Catolica de Chile and attended lectures by Professor Diego Lopez-Garcia and Professor Marcelo Gonzalez concerning earthquake engineering in Chile and construction processes with Portland cement concrete (PCC). Professor Lopez-Garcia is a structural and geotechnical engineer focusing his research on the design of structural systems to minimize devastation caused by earthquakes in Chile while Professor Gonzalez specializes in nanotechnology applied in PCC. 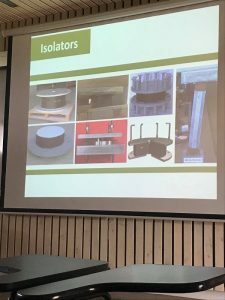 Professor Lopez-Garcia spoke at length about seismic protection systems used throughout Chile and elaborated on various concerns as the systems apply to constructability and practical applications. The first earthquake resistant structure discussed was the Reinforced Concrete Shear Wall Method in which buildings are designed with a complex system of concrete walls rather than using a system of structural columns. These shear walls are cast in place and give the structure high structural stability. This method is unique to Chile and gives the structure a good compromise between strength and stiffness and approximately 90% of buildings with this design do not suffer damage from seismic activity. Professor Lopez-Garcia then continued to introduce several energy dissipation and dampening systems including tuned mass dampers, base isolators and pendulum type tuned mass dampers. 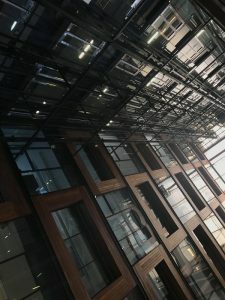 The concept behind these systems is to reduce the movement of buildings during a seismic event to reduce damage since most damage is a direct result of deformation. Most buildings in Chile have some sort of dampening system implemented into their structure and while difficult in application, it is possible to retroactively integrate these systems into older buildings. 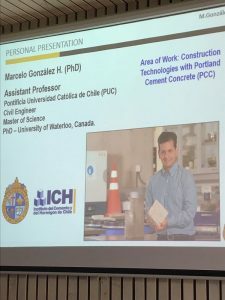 Following Professor Lopez-Garciaís presentation, Professor Gonzalez discussed with us various topics related to Portland cement concrete and challenges faced in concrete construction. One increasingly large problem is the lack of availability of good-quality aggregates in compliance with ASTM C33/C33M-16. This problem is caused by a combination of a difficulty in accruing the resources and the quantity of this type of aggregate used in Portland cement concrete. Mining these aggregates currently requires transportation over long distances which makes collection very expensive and PCC is approximately 60-75% aggregate making this good-quality aggregate necessary. After the lectures, Professor Lopez-Garcia led the group on a walking tour around the Pontifica Universidad de Chile campus. 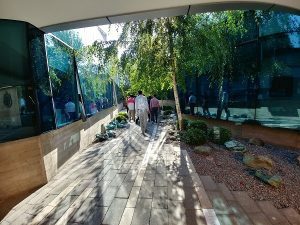 We made various stops along the way to observe energy dissipation systems within the structures of multiple campus buildings. 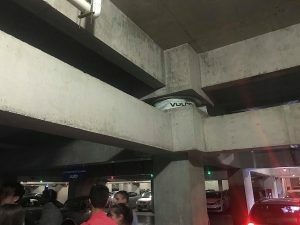 In the photo below, you can see a dampening system in place isolating the base of the Universidad Catolica de Chile Innovation Center to reduce sway during a seismic event. During the tour, we also walked through a geologic exhibit near the center of campus. The exhibit showcased various types of rare rocks collected in the mountain ranges surrounding the city of Santiago. This exhibit was near the center of campus in a pathway below ground level with the intention of imitating a mine in which the rocks were collected. 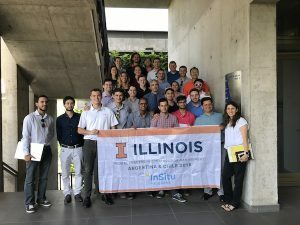 Special thank you to Professor Lopez-Garcia, Professor Gonzalez, and the Pontifica Universidad de Chile for hosting our team and preparing a fantastic visit for us!